Check out the Playoffs tab at Kpreps.com for the complete state football brackets. How did we get there? Well it had a lot to do with some of the great action from Halloween night. In Class 5A, Pittsburg went on the road and clinched a playoff spot by knocking off No. 2 St. Thomas Aquinas, 32-21. The Purple Dragons got a Nick Powers 21-yard field goal as time expired in the first half to take a 17-14 lead. It was a lead they would never relinquish. Ryan McNeely broke a fullback trap 29-yards for a touchdown in the third quarter to expand the Pittsburg lead to 24-14. Aquinas responded with a Sam Ramaekers touchdown run with 10 minutes remaining to pull within 24-21. Aquinas then forced the Dragons to punt and the ball appeared to hit the Saints’ punt returner before being recovered by Pittsburg in the end zone. The officials initially ruled the play a touchdown before huddling and deciding it was a touchback and Aquinas’ ball. The Saints then fumbled the ball at the Pittsburg 45-yard line and the Dragons recovered. Pittsburg attempted to run out the clock and was stopped short on a third-and-3 play, but Aquinas was whistled for a 15-yard facemask penalty to give the Dragons a first down. Alex Barnes then broke a 26-yard touchdown run, his third of the night, to ice the game for the Dragons. Barnes finished with 248 yards rushing on 35 carries. Pittsburg, Aquinas, and Blue Valley West all finish with a 2-1 district record, but the Purple Dragons and Saints both advance for having the top two district point tie-breaker totals. Aquinas is the district champion; Pittsburg is the runner-up. It’s the Dragons first playoff appearance since 2007. In the first ever meeting between the two schools on the football field, Maize South slipped by the Maize Eagles 28-27 on Friday night. The win puts Maize South into the playoffs as the District 7 runner-up. The Mavericks took a 14-0 lead in the first half on two touchdown runs from Korie Frausto. Maize would answer back and tie the game at halftime thanks to a touchdown pass and run from quarterback Connor Lungwitz. Kale Bulloch broke the tie for Maize South with a short touchdown run in the third quarter to put the Mavericks up 21-14. Lungwitz would score again on a short touchdown run to tie the game at 21. Frausto then added his third touchdown with 8:15 remaining in the game to give the Mavericks a 28-21 lead. Connor Lungwitz then hit Alex Lee on a 4-yard touchdown pass with 23 seconds remaining to pull within 28-27. Maize elected to go for the two-point conversion and the win, but Lungwitz’s pass attempt was batted down by Bulloch in the end zone. Hutchinson rode the legs of standout tailback Blaik Middleton to a 35-28 district-championship win over Wichita Northwest. The Salthawks found themselves tied with the Grizzlies at 28 late in the fourth quarter after three consecutive Northwest touchdowns erased Hutch’s 28-7 lead. On fourth-and-3 at their own 32-yard line with 3:26 remaining, Middleton broke free for a 68-yard touchdown run that proved to be the winning points. Colton Fee intercepted a Northwest pass to seal the win for the Salthawks. Middleton rushed 34 times for 295 yards and four touchdowns. Northwest quarterback K’Veion Richard rushed for more than 100 yards and passed for 130 more and a touchdown. Lawrence Free State outscored Topeka High 53-37 to claim the District 5 championship and a first-round playoff game. The Firebirds scored on seemingly every possession of the first half in building a 39-23 lead. Topeka pulled to within 19-16 on an Alec Beatty 18-yard pass to Khalil Austin, but Carson Bowen returned the ensuing kickoff 87 yards for a score. Mike McCoy pulled Topeka to within 26-23, but Bryce Torneden hit Joel Spain on a 51-yard touchdown pass to expand the Firebird lead to 32-23. Torneden then added an 8-yard touchdown pass to Andrew Keating for the 16-point halftime lead. After Bowen’s third-quarter touchdown made it 47-23, Topeka responded with a Beatty touchdown pass and run to pull within 47-37 at the end of the third quarter. But only Free State scored in the final quarter on Khaury El-Amin’s second touchdown run of the game. El-Amin rushed for 131 yards and two scores, while Bowen added 116 yards and a score and Torneden rushed for 113 yards and scored twice. Torneden also passed for two scores. Topeka was led by Beatty’s 99 yards and a score. The Trojan quarterback also threw for 220 yards and three scores, but was intercepted three times. Free State opens the 6A playoffs at home against Wichita Northwest, while Topeka travels to Hutchinson. La Crosse overcame a 14-0 deficit in the first half to top Oakley 27-21 in overtime. The Leopards claimed the District 7 championship with the win and will host Meade in the first round of the 2-1A playoffs. Oakley led 14-7 at halftime, but La Crosse’s Sheldon Schmidt rushed for a touchdown to pull within 14-13, but the PAT failed. Under two minutes later, Oakley quarterback Kendrick Smith tossed a long touchdown pass to Jesse Stewart for a 21-13 lead. Later in the quarter, Leopard quarterback Jack Garcia scored from 55 yards out and the conversion tied the game at 21. After a scoreless fourth quarter, the Leopards and Plainsmen went into overtime tied at 21. Oakley had the ball first, but Smith was intercepted by Andrew Jay. On La Crosse’s possession, Schmidt burst free for a 10-yard touchdown run and the win. McPherson outscored Hays 42-7 over a stretch of Friday night’s game to claim a 42-35 victory and the District 8 championship. Hays built a 14-0 lead early behind the arm and legs of quarterback Alex Delton. Delton threw a touchdown pass and broke a 38-yard touchdown run. McPherson would answer with two touchdowns in the final 4:30 minutes of the first half to tie the game at 14. The Bullpups took a 21-14 lead in the third quarter before Delton tied the game with a 61-yard run. McPherson then took control on Ty Hart touchdown runs of 41 and 40 yards to build a 35-21 lead early in the fourth quarter. The lead stretched to 42-21 at the 6:04 mark of the fourth quarter before Delton hit Keith Dryden for a second time to pull within 42-27. After recovering the onside kick, Delton then passed to Hayden Kreutzer on a 46-yard touchdown pass to pull within 42-35. The Indians couldn’t convert a second onside kick. Hays would get the ball back later, but Delton’s interception sealed the game. Hart finished with 170 yards rushing and three scores for McPherson. Quarterback Cody Starkel passed for more than 200 yards and a touchdown in filling in for the injured Kyler Kinnamon. Dillon Engelland rushed for 112 yards and three touchdowns to lead Buhler to the playoffs by virtue of a 28-14 win over Abilene. The Crusaders trailed the Cowboys 7-6 at the end of the first quarter before Dakota Wolf scored on a short run to give Buhler a 14-7 lead. Engelland added his second run, from 12 yards out, to put the Crusaders up 21-7 at halftime. The lead grew to 28-7 in the fourth quarter when Engelland scored from 10 yards out. Abilene added a touchdown in the final minute on a pass from Harley Hazlett to Dalton Goodwin. Brody Southwell connected on a 23-yard field goal early in the fourth quarter to lift Fort Scott to a 23-22 road-win over Paola. The Tigers improved to 8-1 on the season and clinched the District 4 championship with the win. Paola drove inside the Tiger 15-yard line late in the fourth quarter, but the Panthers were stopped short on a 4th-and-2 play. Fort Scott sealed the game with a late interception. Brendyn Quinney rushed for two touchdowns for the Tigers, while Ryan Gleghorn and Jacob Goodhart each eclipsed 100 yards for Paola. Paola scored late in the second quarter to take a 22-14 lead into the break. Mason Knopp hit Alex Fink on a 25-yard touchdown pass in the third quarter to pull the Tigers within 22-20. Winfield scored a touchdown with 21 seconds remaining to top Coffeyville 42-34. The Vikings then needed an interception on Coffeyville’s Hail Mary pass at the end to pull of the win. Despite the win, Winfield misses out on the playoffs and Coffeyville qualifies as the District 5 runner-up. Coffeyville led 26-20 at halftime. Tony Barksdale Jr. rushed for more than 230 yards and three touchdowns to lead Shawnee Heights to a 28-20 win over Topeka Seaman. Heights claimed the district title and a home game in the first round of the 5A playoffs against Lansing. Topeka Seaman will travel to Leavenworth to open the playoffs. 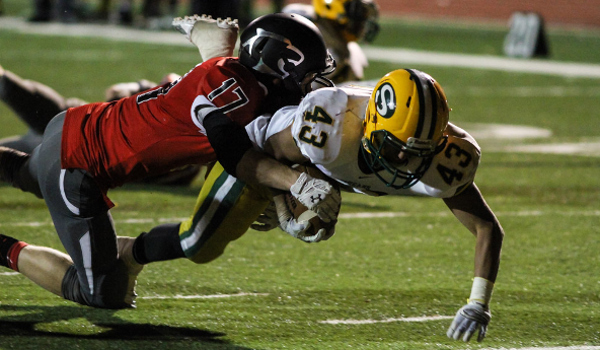 Salina South rallied from down 21-14 in the fourth quarter to top Great Bend, 35-21. Sam Corona tied the game for the Cougars with a touchdown run early in the third quarter. The Cougars then took the lead on the third touchdown pass of the night from Dalton Wassenberg to Dylan Becker. Wassenberg then scored again later in the fourth quarter from six yards out to give South the 35-21 win and the District 6 title. Blue Valley Southwest broke out to an early 10-0 lead, but Blue Valley West came storming back for a big 54-26 win. West scored 35 unanswered points in the first half behind four Tyler Cox rushing touchdowns. Collin Gallery threw two touchdown passes for Southwest in the final two minutes to trail 35-24 at halftime. The Jaguars tacked on three second-half touchdowns to pull away. Cox rushed for 282 yards and five touchdowns on 26 carries. Quarterback Nathan Wiles passed for 130 yards and three touchdowns for West.